BUSINESS NEWS WHY WAS OKONJO IWEALA NOT NOMINATED FOR WORLD BANK PRESIDENT? 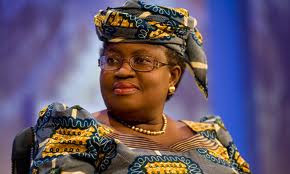 WHY WAS OKONJO IWEALA NOT NOMINATED FOR WORLD BANK PRESIDENT? Nigeria’s Ngozi Okonjo-Iweala doesn’t stand a chance of being The World Bank’s President, at least for now. This is because nominating process for the position closed on Thursday without her name on the list. According to a statement released on the World Bank’s official website, the Board of Directors announced that the period for the submission of nominees ended Thursday, March 14th. Only one nominee was received throughout the nominating period. And he is a US national named David Malpass. Mr Malpass will be considered for the position, the statement said. David Malpass is a US citizen who currently works as an Under Secretary for International Affairs, at the US Department of the Treasury. Trump chose a loyalist for the job – Last month, Mr Malpass was nominated by the US President, Donald Trump, who had long clamoured for the position to be occupied by an American. Note that Mr Malpass had long been a staunch critic of the international development bank. He is expected to get the job. However, he will first go through the interview process. “IN ACCORDANCE WITH THE PROCEDURES PREVIOUSLY ANNOUNCED, THE EXECUTIVE DIRECTORS WILL CONDUCT A FORMAL INTERVIEW OF THE CANDIDATE IN WASHINGTON D.C. DURING THE COMING DAYS. The position of President was left vacant early January after the former President, Jim Kim, abruptly resigned three years ahead of schedule. Mr Kim had been appointed out of three available nominations – Nigeria’s Ngozi Okonjo-Iweala and Colombian Jose Antonio Ocampo. With the abrupt resignation of Jim Kim, it was believed that a Nigerian might just for the first time lead the World Bank; thanks to her popularity in the international financial institution. The World Bank has never been headed by a Nigerian in the entirety of its 73-year history.